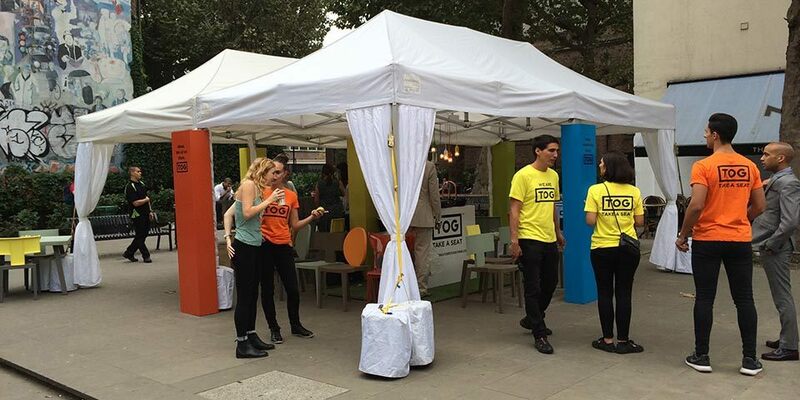 Global brand agency Sense required production support with their pop up experience, on the high street at Tottenham Court Road, Central London, opposite the Heals store, to create awareness of their client’s new range of ‘TOG’ furniture. We were asked to help with the complicated production for this pop-up design created by the experiential marketing agency. 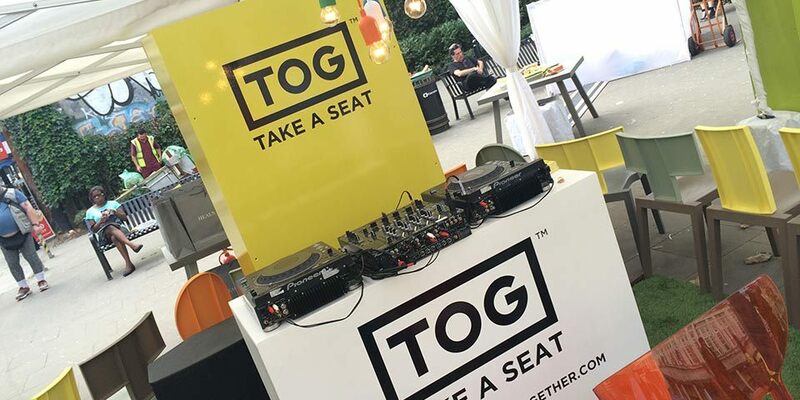 Creative included a customised and fully branded pop up marquee positioned in the middle of a busy street pavement, all focused around a fun musical chairs game to drive awareness and data capture for end client TOG. They enlisted our help with the marquee, lighting, sound, DJ equipment and power. 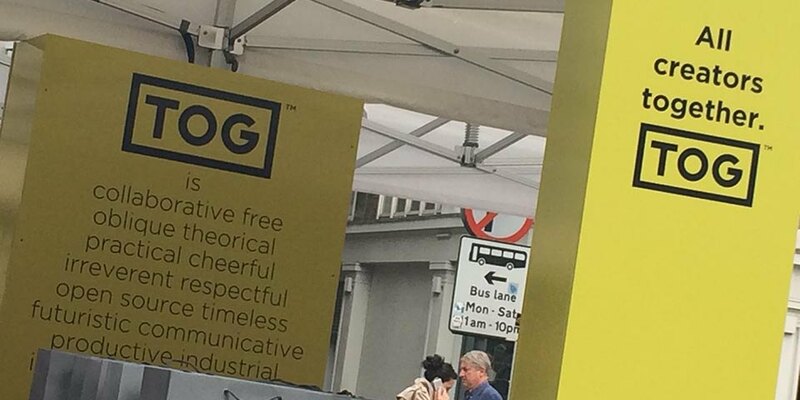 The experiential was to run all day, with a game of musical chairs every half hour to win one of Heals’ new ranges of ‘TOG’ chairs. In order to make this happen we constructed two Marquees to create a 6m x 6m covered area. We then placed vinyl branded boxes around the legs to create pillars. In the centre we laid Astro-turf and set up a DJ booth on top of with a hanging light solution above. A sound system was provided for the music for the musical chairs games and a microphone for the MC to gather interest from the public. All the electrics were supplied by a silenced generator, which we also surrounded by a hide to keep it hidden from the public. This solved the problem with being in such a small public place. 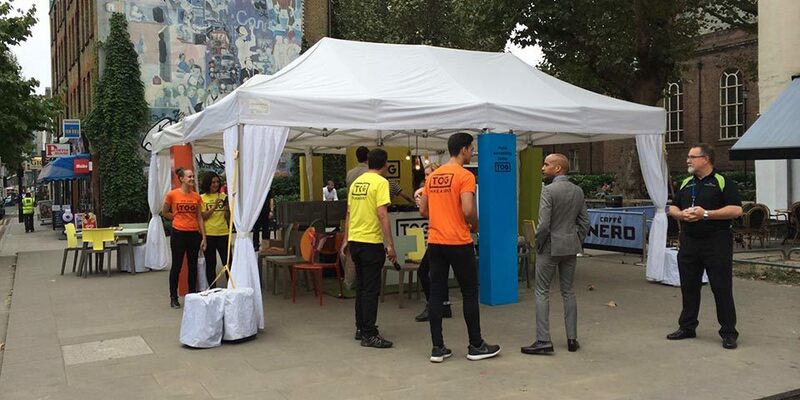 A successful experiential pop up event that went perfectly, with a happy client and great participative response from the public.